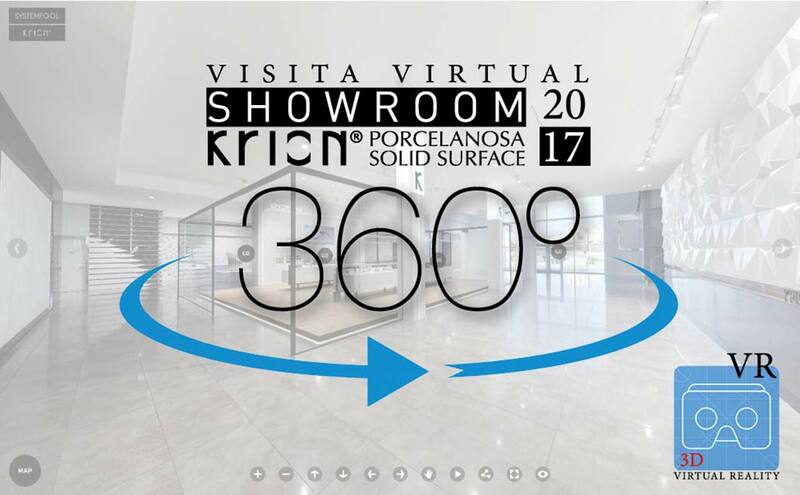 One of the essential annual events for KRION® is the presentation of the Virtual Visit, a commitment which began in 2011, for renewing concepts for attendees of our exhibition, and presenting new products to everyone who cannot visit our facilities in Vila-real. In 2016 we presented the new VR visit, to be viewed with cardboard virtual reality glasses; and in this new 2017 visit, we have improved mobility between points, perfecting and enriching the result of the experience. As everyone who visited us during the Exhibition, and everyone who continues to do so during the rest of the year knows, like the exhibition, the virtual visit is divided between 2 floors: a lower floor where we can appreciate the possibilities of the Solid Surface from PORCELANOSA Group, KRION®; and the first floor where the KRION® BATH products and series and SYSTEMPOOL products are presented. We hope that you visit our virtual facilities and enjoy the possibilities of our material KRION®.